With the fall of PASPA and the legalization of sports betting in four new states, both professional and new gamblers alike are scouring the internet on how to proceed. Commonly these searches will lead potential customers not to an online sportsbook, but to an affiliate that has been working behind the scenes with the book to try to find the most valuable bettors. 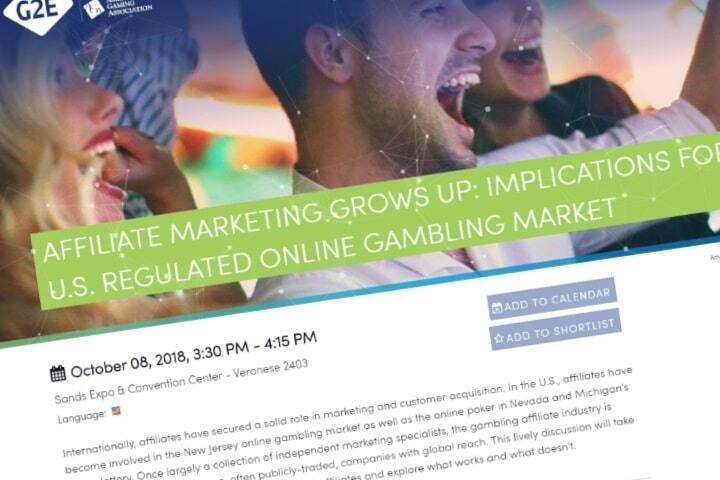 A panel called “Affiliate Marketing Grows Up: Implications for the Regulated U.S. Online Gambling Market” at the Global Gaming Expo (G2E) in Las Vegas on Monday laid out how those partnerships work. Panelists included former Tropicana iGaming executive Christopher Capra, Hard Rock Director of Online Gaming Lee Terfloth, and, representing the affiliate side, Catena Media Acting Director U.S. Chris Grove and Paysafe Marketing Director Erica Anderson. Anderson said that a perk for gaming operators is that affiliates get paid based on carefully measured results, unlike some other partnerships the operators have. She added that affiliates in Europe often get a share of the net revenue of new player acquisitions. But Grove said that as legal online casino gaming and sports betting grow in the U.S., that approach isn’t likely to flower because once an affiliate gains that share, “historically the minute that you touch a percentage of the revenue — once you dip a toe in that stream in the U.S. — you enter a new level of licensure. That’s been the case in New Jersey, and it will be the case in Pennsylvania, and likely in a number of states as we roll out. “We call [the higher level of scrutiny] a full cavity search,” Grove added, drawing a laugh from the audience. Former Tropicana exec Capra said that shortly after New Jersey legalized online gaming in late 2013, just weeks behind Delaware, affiliates helped to “educate the market” about the newly legal product in a way that would have been much more expensive for an operator to achieve. Capra said that result is likely to be reproduced as more states roll out online gambling. The inevitable third trend, Grove added, is that more of the former companies become public companies — his Catena is an example, Grove said, as is XL Media. European companies have been consolidating independent affiliates and using it as a “rollup strategy” before using public funds to increase their power. Hard Rock’s Terfloth, whose Atlantic City casino just opened in June, said his casino “is still defining how affiliates fit into our strategy.” But at some point, Terfloth added, Hard Rock will work with affiliates — probably next year, he said. Capra said from the operator side, in a mature market there are very high acquisition costs for the dozens of legal sites in New Jersey. That leads operators to closely look at the value of those players brought to them via the affiliates. Grove said his company relies heavily on organic searches, and a lot of that traffic is driven by “high-intensity searches” — meaning that someone who uses those terms in the search is more likely to be a high-value customer, due to a clear intention to try that form of gambling. As New Jersey Division of Gaming Enforcement Director David Rebuck sat in the audience, Grove said that a key issue is utilizing regulation to draw as much demand as possible from “the black market” — offshore online casino sites — to the regulated market. Of course, that is exactly the drum Rebuck has been pounding for quite some time now. After five years of online casino gaming in New Jersey, now the big online marketing push has become sports betting. Grove said the “definition of what an affiliate is” will change dramatically because with sports betting, numerous large sports media companies who have had no interest in the online gaming niche will feel differently about sports betting. Still, Capra said holdover affiliates will have a chance to score on niches such as language markets — including Spanish and Asian options.